It's a big week in college football for CAL Fans. We're playing USC this weekend and even though both teams have under achieved, CAL is still dying to beat them. For some, Pete Carroll, USC's head coach, is the bad guy. Others dislike their stable of High School All American players. I know it's deeper than those two groups though. 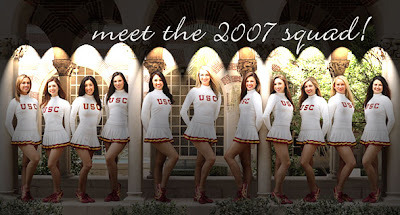 I firmly believe that it all starts with those USC cheerleaders. The recruiting brainwashing begins early. Would-be football players are watching ABC at the age of 10, trying to decide where they want to go to school some day, and then the camera flashes the Dance Squad and it's all over. That kid is going to USC, no if's, and's or but's. It's a done deal. It's ugly, I know. But it's the truth. Taylor, a newly converted CAL fan, has infiltrated their secret society and provides this link. Do your research people. We need to know the enemy.